An excellent, affordable limiter/compressor that could be an absolute killer when that elusive brickwall option gets worked in. Crisp, punchy sound. Extra creative controls. Affordable non-commercial licence. Responsive meter. Adjustable lookahead. Flavour settings too subtle. Lacks 0dBFS ceiling/brickwall function. The limiter is a fundamental tool these days, and we keep getting newer, better, more transparent designs for maximising levels without changing the character of the signal. But some prefer to bend their limiter designs towards more sonically creative applications. 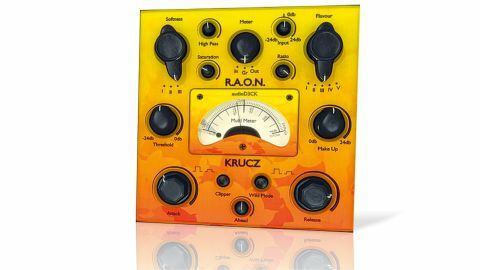 Krucz - the latest plugin (VST/AU) from new Hamburg-based developer audioD3CK - makes it clear from the outset that adding colouration is very much part of its remit. "Krucz combines a compressor and a soft clipper, so you get compressor-style Attack, Release and Ratio knobs with adjustable Lookahead, and a Clipper on/off"
A quick look at the controls reveals some obvious clues that would support this theory: Saturation, Flavour and Softness to name just three. Signal levels are handled by Input gain (+/- 24dB), Make Up gain (0-24dB) and Threshold (-24-0dB) controls. Krucz combines a compressor and a soft clipper, so you get compressor-style Attack, Release and Ratio knobs with adjustable Lookahead, and a Clipper on/off button. Unlike most of today's limiters, although the Ratio goes up to infinity:1, inter- sample peaks can still be produced by the clipping algorithm, so it's not a brickwall limiter in the modern sense - though apparently this feature will be added in a future update. The creative sound-shaping tools include the aforementioned Softness (offering three clipping knee shapes), Flavour (subtly changing the clipper characteristics), Saturation (adding odd harmonics) and Wild Mode (a soft knee option for the compressor). Rounding things off is a high-pass filter (0-120Hz, filtering the output signal rather than the internal sidechain) and a multifunction meter (In, Out, Gain Reduction). The window can be freely resized, too. audioD3CK claims that Krucz is designed for limiting sounds or sub groups prior to the main mix bus, and that it works particularly well on sub bass. Trying that first, we found scope for many treatments: shorter Release times and higher Saturation levels add grit to the sound, while with longer Release times, Lookahead set to maximum and minimum Saturation, Krucz is good at gently levelling bass tones of all types. Add in the soft clipper at the lightest Softness setting, and you can also tastefully enhance the attack. The high-pass filter is useful for bass too, although it's quite gentle, so don't expect radical low-end curtailing; and we struggled to hear the Flavour settings make much audible difference. We think Krucz performs best on drums. Purely as a high-ratio limiter, it can slam kicks and snares to create tough sounds, with the soft clipper and saturation on hand for more extreme processing. It sounds awesome on room mics and drum loops. In all cases, the Lookahead control has significant influence, the minimum setting delivering the most edgy, distorted sound, the longest being cleaner and more predictable. On other material, such as acoustic guitar and piano, staccato sounds are handled better than sustained ones, although with some careful tweaking Krucz can be made to work reasonably well on the latter as well. Without proper brickwall or ceiling options in place, Krucz just can't deliver mix maximising, which is at the top of our wishlist. Despite that, though, if you want audible, edgy processing with plenty of options and a beautifully responsive meter, this is a very impressive plugin at a great price.